It's never easy writing about media freedom. Even in countries where there is no official censorship, all reporters know there will always be some restraints on what they can say - editors need to be persuaded, owners need to be kept happy, the law has to be obeyed. Where there is official censorship - where, for example, it is a crime to "bring the government into disrepute" or to publish material which "insults the dignity of the head of state" - the problems are all the greater. No freedom is absolute, yet some media are a great deal freer than others. In the Arab world, in general, the media have been heavily politicised. But then, one day, along came the internet. And it was as if someone had blown open a few million doors. Now, everyone can write - weblogs, or blogs, were born, giving everyone with access to the internet exactly the same opportunity to write and publish as the most powerful media tycoon. That, at least, is the theory. There are now 70 million blogs in existence; 120,000 new ones spring up every day. True, most of them are read only by their authors, but some have immense influence - and in the Arab world, some are now much more popular than the traditional print and broadcast media. But being online does not mean being free of government restrictions. In Egypt, bloggers can claim some successes: after they posted video images of police torturing detainees in custody, police officers were put on trial and jailed. But one blogger has himself been jailed for insulting Islam, defaming President Hosni Mubarak, and "spreading information disruptive of the public order". Others face harassment and live in fear of arrest. 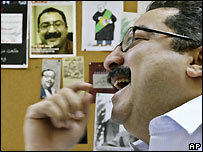 So are the "new media" - blogs, websites, chatrooms - now becoming the only truly independent media in the Arab world? That was the question at the centre of a BBC debate I chaired in Cairo last week - and the response from the audience, despite the restrictions still in place, was overwhelmingly Yes. Many contributors to our debate said they trust what they read on blogs much more than what they read in the newspapers or hear reported on the official broadcast media. To which the response from the "old media" journalists was: but who checks what the bloggers write? Who edits it? If you do not even know the blogger, how do you know they are trustworthy? An American former dot.com entrepreneur wrote of the blogging phenomenon: "It's seductive in the sense that it convinces people to think they have more to say and are more interesting than they really are." On the other hand, if they are boring and have nothing to say, no-one will read them. If there is little trust in the established media, it is hardly surprising that many people, especially young people, will turn to new media. But the consensus at our debate in Cairo seemed to be that, for the time being at least, there is a need for both old and new. After all, some of us straddle the divide: many of us "old media" journalists now also write "new media" blogs.